Heptane is a clear, colorless liquid hydrocarbon, obtained from petroleum. The flammable liquid has a vapor that travels considerable distances, and is known cause flash fires. Heptane belongs to the petroleum hydrocarbon solvent family and has a hydrocarbon solvent type odor. Heptane releases vapors at or below ambient temperatures. Vapors are heavier than air and can travel long distances, along the ground, finding an ignition source and flash back. Heptane storage containers must be tightly sealed to prevent any leaks or spills. Inhalation: Breathing high concentrations of heptane mist or vapor can irritate the throat and lungs, causing the central nervous system depression; symptoms include headache, dizziness, drowsiness, nausea, or unconsciousness. Ingestion: Heptane can irritate the mucous membranes of the mouth, throat and esophagus. If ingested, symptoms include a burning sensation of the mouth and esophagus, vomiting, dizziness drowsiness and central nervous system effects. Skin Contact: Heptane can cause skin damage, depending on the amount of material that comes in contact with the skin and how soon it is removed. Symptoms may include itching, burning and redness. Eye Contact: Temporary eye irritation can occur from contact with sprays or mists. Symptoms may include redness, swelling, stinging and watering. Heptane storage containers – US Chemical Storage. A spill or leak can cause an immediate fire or explosion hazard. Heptane storage containers must remain tightly closed and stored in a cool, dry and well ventilated chemical storage building. Avoid storing near heat, sparks, or any other ignition sources. Protect containers against physical damage and ensure routine inventory checks. Heptane storage containers should be stored away from oxidizing agents. 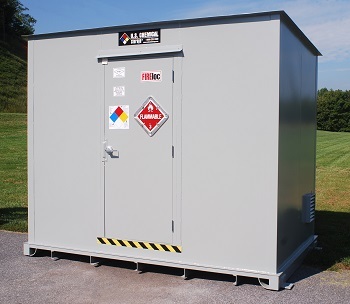 Chemical storage buildings must meet OSHA requirements and applicable fire codes. Workers should wear appropriate PPE when entering storage atmospheres and contaminated areas. Do not breathe in vapor; always use proper respirators to protect workers from hazards. Avoid contact with food and tobacco products. Call or visit us online to learn more about chemical storage buildings for heptane or to receive a free chemical storage consultation.